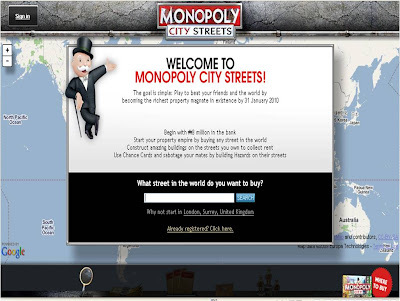 Monopoly City Streets launched just before lunch in the UK today and has the potential to be one of the greatest things on the internet - a giant, global game of Monopoly based on Google Maps with the opportunity to buy any street in the world! But insufficient server infrastructure has meant that many people have been left frustrated by either being unable to access the site or getting in and finding a painfully slow, consistently crashing interface (for a long time it also seemed that Firefox was the only browser able to access the Monopoly City Streets site). The Monopoly City Streets blog has hundreds of comments from disappointed users and Twitter has been full of 'Monopoly FAIL' messages. 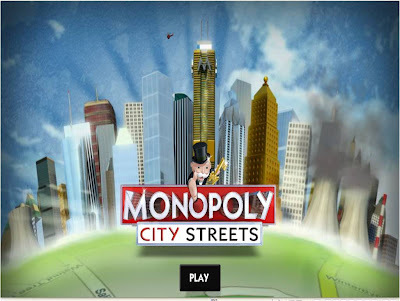 However, if the UI frustrations are put to one side (and can be sorted out quickly), Monopoly City Streets looks like it will be great fun. I have managed to make some purchases (though not necessarily first choices) and I'm all set up to start building / finding friends etc. I have spent most of the 3,000,000 starting funds and I am now the proud owner of amongst others - Vicarage Road in Watford, Shoot Up Hill in London, a street in Gothenburg (Sweden), various places where we have previously lived and my favourite, between the 'Grand Army Of The Republic Highway' and Interstate-81 in Pennsylvania, BURCHER STREET! 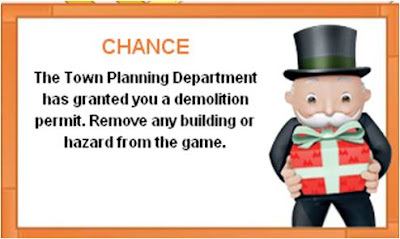 I have also found Monopoly City Streets offering me the Chance to 'build a factory' on someone elses street or a 'demolition permit' to 'remove any building or hazard' from the game - but I haven't taken up these offers. After people have battled against snail-paced servers, it doesn't seem fair to be knocking things down / removing them from the game! This is a great way of re-inventing a traditional game, basing it on Google Maps / OpenStreetMap and building a global community around a common theme. 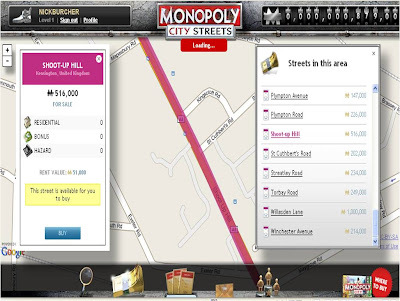 Interesting to see how it all pans out, whilst Facebook Connect / Twitter integration to auto-post notification of purchases / activity, as well as the ability to play through a mobile phone, could make Monopoly City Streets even more interesting.